This Premium Extension allows you to upload, manage, protect, and sell images from right inside your existing WP-Client installation! Want to share images with your existing clients, or optionally sell them high-res downloads of photos? It’s as simple as installing Shutter right along-side your already running WP-Client. Shutter integrates seamlessly with WP-Client, allowing you to install Shutter and beginning assigning Galleries to your already created clients, so you don’t miss a step along the way! Sell Images At Multiple Price Points, or For Free! Within Shutter, you have the power to set multiple pricing options for all of the images you upload. These pricing options can be set individually on a per-image basis, or they can be applied in “bulk” using Shutter’s built-in “Custom Pricing” functionality. You can setup a “standard” price point that applies to all of your images, and have that price automatically applied to all images in all Galleries. Additionally, you can edit on a single image level, adjusting the price of individual images to fit your needs. You can also optionally have a “free” price point for any image, allowing your clients to immediately download without making payment. Create Public Image Galleries, or Assign Them to Clients! Galleries will serve different purposes in different scenarios. There may be some images you would like to display to all who visit your site, as a “sample”. Other Galleries may be more private, and should only be visible to logged-in users of your site. Still others may be meant only for specific clients. With Shutter, you can control the privatization and permissioning of Galleries on an individual level, allowing you to precisely control who has access to which images and Galleries. Regardless of who the images are meant for, if you plan to charge payment for them, you will want to implement some kind of protection of your images, so users are not able to circumvent the price points you have set for your images. Shutter provides you with a host of watermarking options, allowing you to customize your own watermark (image or text) to apply to all of your images and thumbnails in your Galleries. 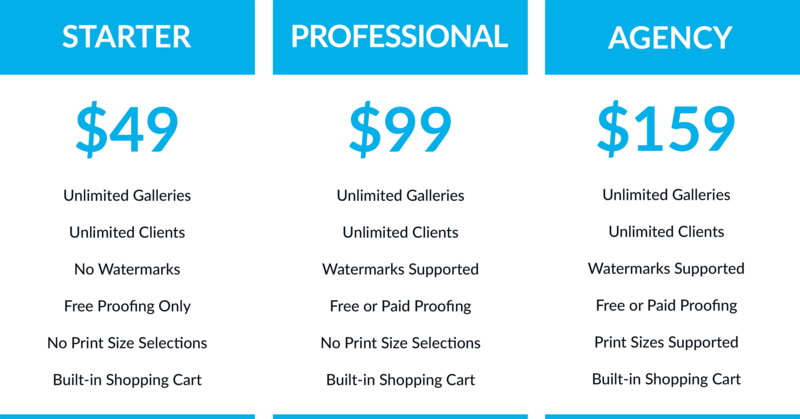 Once applied, your watermark will only be removed from the images once a client has paid for them (or added them to their cart if the image is free). All the benefits of a fully featured Online Gallery solution, seamlessly integrated into your existing Portal! Let your customers and clients proof images with or without payment. Clients can login and simply make selections. After making payment (if applicable), they will then have access to download the high quality files for their selected images. You can also setup to have clients pay for the images they select – this is not necessary however. Designed from the ground up to integrate into your existing website. Shutter uses a combination of shortcodes & your existing theme. Shutter is designed to be responsive so that it contributes to being viewed nicely on mobile device. A responsive theme also helps in this regard. You don’t need to design another website to use Shutter, just install and get started. Only WP-Client CORE, and the Shutter Extension, are required. Creation of galleries with an unlimited amount of photos. If you already have an existing WP-Client client base, you can assign Galleries to a client with just a few clicks. If you do not already have clients created, this can easily be done in just a few minutes using the ‘Add Client’ form. You can also allow your potential clients to register themselves using a form on your site, letting you generate potential business automatically. You can make galleries public, private, or even specifically permission galleries to one individual client, several clients, or all clients. Shutter also gives you the flexibility to set all your image prices to free, thus allowing a simple client proofing system that does not require any payment. Your clients can simply choose the images they prefer, and click submit to receive a zip file of those images. Shutter permits you to easily add either a text based or image based watermarks to your image previews. Only the previews on the website are watermarked, and this is done with an overlay type process. Watermarks are added in bulk to make the process quick and easy. When your clients decide and process their choices, the images they receive will be full size/quality, and will have no trace of a watermark. Untouched. Shutter utilizes all of WP-Client’s provided payment gateways, allowing you to provide your clients with several ways to pay. Shutter uses IPN confirmation to ensure that the payment is verified and only then does the plugin grant permissions for the client to download full size/quality images. You can set your order process up either as a simple proofing system where clients don’t pay, they only choose which images they like. This would be used in a simple scenario where you allowed the client to view the entire gallery, and easily choose which images they liked the best. Additionally, you can set up your galleries so that each image carries a dollar value, and after the client chooses, the total dollar amount is added and the client is directed to a payment gateway to complete payment. Only after the payment is made and verified is the client able to access the full size/quality images. Control of image sizes for thumbnails and full size photos. You can easily set the width and height for thumbnails in your galleries. Easily set the width and height of the images as they appear in the lightbox preview. You can set both thumbnail and lightbox previews to crop in relation to the image ratio, or you can set to hard crop in order to get uniformity when you have various size images. How does buying an À la Carte Extension work? You will remain at your existing Web Portal License Level (Basic, Plus, Developer or White Label). The Shutter Extension License Level you purchase may be activated on ONE of your active URLs. FREE EXTENSION UPDATES for LIFE: Purchase the Shutter Extension ONE TIME and it’s yours FOREVER. No additional yearly fees for updates or support for this Extension as long as your yearly fee for the Web Portal core is up to date. This means as we continue to develop and improve the Shutter Extension, you’ll continue to benefit. INSTANT ACCESS: As soon as you purchase via the link above, you will have instant access to download the Extension in your Control Panel.